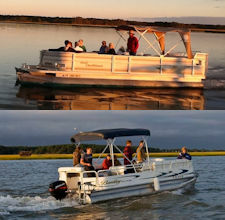 A boat tour is a must do activity for your Chincoteague Island vacation! You will gain a perspective of the area that is not achievable any other way! Scroll down for complete list of tour boat companies. Each of these tour boat companies has licensed, capable and experienced tour guides. "Where are the Wild Ponies?" 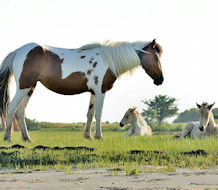 Since 2001, the Pony Express Nature Cruise has provided the best opportunity to observe wild ponies along the boarders of Assateague's extensive calm western shoreline. Located at the Assateague Nature Centre on Chincoteague Island, just across the channel from Assateague and the Wildlife Refuge. Departs from the closest dock to Assateague. Spend more time along Assateague looking for wild ponies, dolphins, eagles, shorebirds and other wildlife. Enjoy a sunset wildlife cruise for a spectacular coastal experience and a close up view of the Assateague Lighthouse. Experience extraordinary views of the lighthouse, wildlife refuge, ponies and wildlife right from our dock. Cruise/kayak packages & group/family discounts available. Be sure to call ahead for reservations. Excursions guided by a native boat captain and former Park Ranger for the National Park Service. Featured on the ABC "Good Morning America" show, Coastal Living Magazine, Southern Living Magazine, Family Fun Magazine and more. Assateague Tours offers the best Boat Tours and Kayak Tours along Chincoteague and Assateague Islands. We offer group tours as well as Private Exclusive Tours. We will take you to the most remote areas of the National Refuge for ponywatching and birdwatching. Assateague Boat and Kayak Tours will get you up close and personal with the wild Chincoteague ponies and all the wildlife Assateague Island has to offer. We offer morning tours, pony tours, nature tours and sunset crusies. 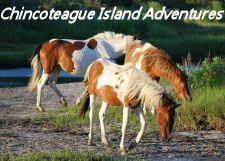 Assateague Tours will tour the great marshlands of Chincoteague & Assateague. We go around the islands to find the world famous Chincoteague ponies, dolphins and the biggest selection of native birds on the east coast. 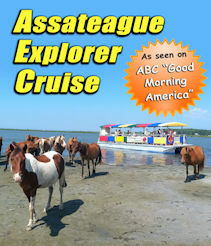 Just call us at 757-336-6176 to make a reservation or visit www.assateaguetours.com for more info. Come take a boat tour with Master Captain Barnacle Bill! Enjoy breath taking scenery as you sail the Chincoteague and Assateague Island waters in search of adventure and discovery. Amoung some of the things you will see are Bald Eagles, Wild Ponies, The Assateague Lighouse, Dolphin, a large veriaty of birds and waterfowl, and some of the most beautiful sunsets you will ever experiance. Because Bill and his family are from Chincoteague he can tell you many storys about life as it was years ago when his grandparents lived, worked, and even whent to school on Assateague. "I am Barnacle Bill, your Captain, born and raised in the same house that my dad was born and raised in on Chincoteague Island." Captain Barry's Back Bay Cruises is an interactive skill building experience. We are a floating classroom, a research vessel with hands-on, feet-wet lessons. One of the many things we do is get off the boat on the sandbars to go dig in the mud for sea creatures. Then its back on to cruise to a crabbing spot where you will pull crab pots on board to identify and see the day's catch. If you have the courage I'll teach you how to hold a crab without getting pinched. Navigating our way to Shell Island Beach, we stop and get off the boat for some shell collecting then back on the boat for Captain Barry's favorite activity... hunting for jellyfish! We will then haul in the trawler net with its abundance of marine life. Now its time to get a taste of Chincoteague, harvesting our famous salt oysters. Time to slow the boat down to enter the shallow waters... how many birds can you identify? We use all of our senses - sound, touch, taste and smell - to make our cruise informative and fun. There is never any pressure, always lots of fun... you can relax, sit back on the boat and be the official photographer, or you can get it. This is the real deal If you want to get your hands dirty and feet wet so you will experience the life of a true Chincoteague Waterman. Try our newly modified "Pony Tour" now available daily in the afternoons, search up to 21 miles of pony viewing coastline. Our “Pony Tour” finds ponies at a distance of less than 100 yards over 90% of the time. 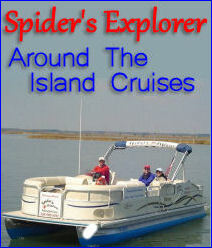 On our "Around the Island Tour" we search for ponies, dolphin, wild fowl, and other local sights. Travel over 25 total miles of unique coastline, never passing the same area twice, see it all! All trips are 2-3 hours, and include local history and commentary from your guide. Afternoon "Pony Tour" may be aboard our larger 14 passenger boat. All other trips aboard our 6 passenger pontoon boats. 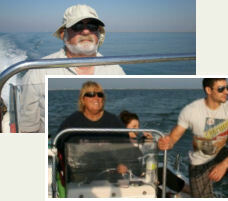 Groups of more than 6 inquire about a private tour aboard our larger boat. Board from the floating dock in the Downtown Park adjacent to Don's Seafood Restaurant. Captain Randy Birch is a true "Teaguer" - he was born and raised on Chincoteague Island and for his whole life has made his living on and around the island. He is a waterman by trade, harvesting hard and softshell crabs, minnows and horseshoe crabs during the summer, and guiding waterfowl hunts in the winter. He knows the waters intimately and lends a unique authenticity to the tour experience. Captain Randy knows where the Wild Ponies live and he will take you to see them. Sunrise and sunset tours are recommended, other times are available upon request. Please visit his web site for more information. 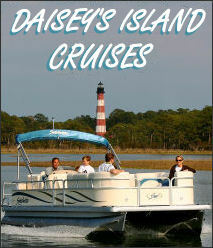 Cruise remote areas of Assateague Island with the life-long local guides of Daisey’s Island Cruises. Owner and Captain, Carlton Leonard, is a Chincoteague Island Native and been a waterman most of his life. Every tour is rich with history, humor and education on the wildlife and local landscape of Chincoteague and Assateague Island. We will take you to where the wild ponies live. Our scenic nature tours feature close-up views of the world-famous ponies, dolphins, bald eagles, and beautiful sunsets... all from our exceptionally comfortable pontoon boats. With tours limited to six passengers, there is always plenty of room to relax on the spacious sofas, while your Captain fills you in on all the local knowledge. Don’t miss what is sure to be the highlight of your Chincoteague vacation! Please check out our web site and read our customer testimonials. Chincoteague Island Inland Bay fishing for flounder, kingfish, croaker, bluefish, trout, or spot on board a 26 ft. Pontoon Boat. Species may vary during season. All bait, fishing rod/tackle & licenses supplied or bring your own. 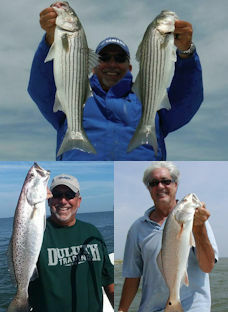 Captain experienced with over 30 years fishing the inland waters of Chincoteague Island. Children welcome and handicap access available. Scenic Cruises available also. Over 40 Years "On The Water". A very seaworthy Parker 23' Center Console with enclosed head, oversized T-top and 200HP Yamaha Outboard affords you the opportunity to tour the back bays and inlet to observe Chincoteague Wild Ponies, various waterfowl and salt marshes. Also obtainable are trips offshore where you can witness Dolphin in the wild. We can accommodate up to 6 people. 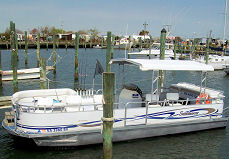 THE PROUD MARY is a 24 foot BayRider skiff with plenty of room for six anglers or pleasure cruisers. Take a fishing charter with Captain George, or tour the surrounding area and go to the back bay to view nature. All bait and tackle is included. Just bring your snacks and beverages. Don't forget your sun screen, cameras and sun glasses. With no more than six passengers, sit back and enjoy your trip. The Proud Mary offers two hour and four hour trips. THE PROUD MARY TOO is a 19 foot Carolina Skiff. Join Captain Mary on a CUSTOM TOUR of the beautiful waters that surround the Island. Captain Mary will create an experience made just for you. Possibilities include a quest to find wild ponies and see dolphins in their natural habitat, pulling crab traps and bringing home your catch, or a private picnic on a sand bar. 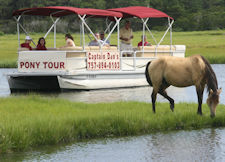 There are several choices for tours of Chincoteague and Assateague, but few that will get you as close to the Ponies and other wildlife as Captain Henry. We always travel all the way around Chincoteague Island and through the backwaters of Assateague Island to get the best possible view of the Chincoteague Ponies, Dolphin, Eagles, Osprey, and other wildlife that you came to the island to see. Our shallow draft vessel will navigate hard to reach areas to get you as close as possible to the action. Don’t take our word for it. We pride ourselves on the positive feedback that we consistently receive from Tripadvisor. Come see why we have consistently been awarded Tripadvisor's Certificate of Excellence year after year. Click here to read some of our customer reviews! Around the Island we go! Cruising April-October around Chincoteague and Assateague Islands. 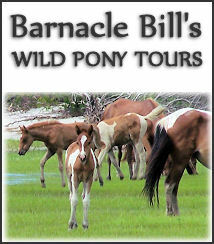 Compliments abound from our customers who have experienced wild ponies, bald eagles, dolphins, shared lore of this area. Please call 757-990-4242 to reserve your personal, intimate tour on our very plush and comfortable boat. Captain Fleming is also an Accomack County, Virginia, Marriage Celebrant.